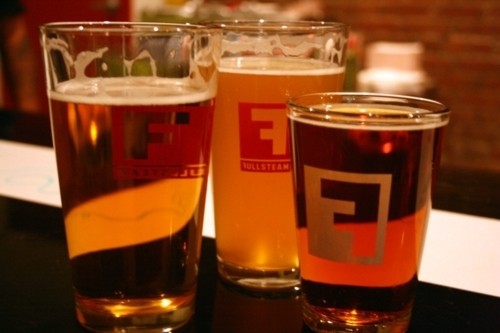 Fullsteam Brewery’s tavern has been open since August, serving up beers that focus on Southern ingredients, from the grains to the produce that sometimes gives them a bit of extra flavor. I’m not a beer drinker, but I am someone who loves to try new things including interesting ingredient combinations. With a line of offerings that have ranged from Carver sweet potato ale and Hogwash hickory smoked porter to Summer Basil farmhouse ale, they’ve got plenty of that! 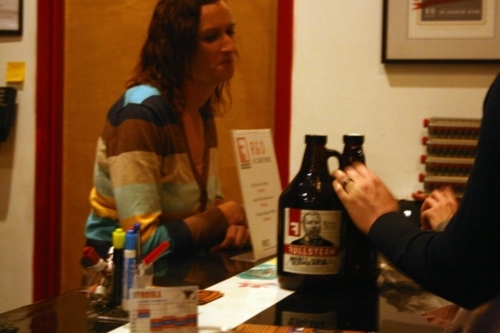 Beers are available at very affordably priced sizes of half-pints ($2), pints ($4), and growlers ($10). Growlers returned for more grog. In addition to the beer, Fullsteam has been offering up tamales ($3.50) from Dos Perros that are steamed in Fullsteam’s beer. They also have peanuts, and there’s usually a food truck or two (or four this last weekend because of Troika) around. Joey D’s NY Dogs has taken up nearly daily residence there as well. and the bar that has a ribbon of dry eraser board just waiting for your next marker masterpiece. 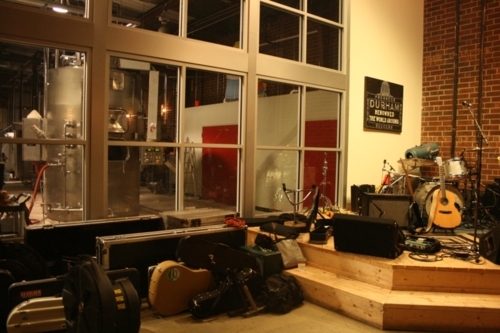 There’s also, of course, the brewery space with towering vats behind a huge wall of glass. 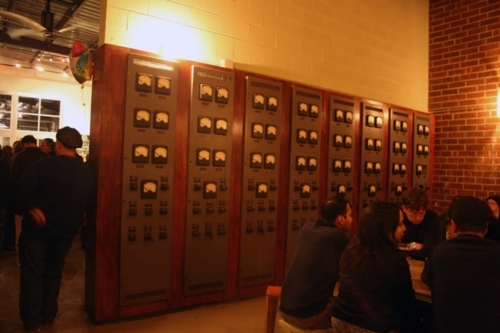 Don’t miss the Wall of Awesome near the bar, with names of Fullsteam’s original donors. There are a few pinball machines, too. 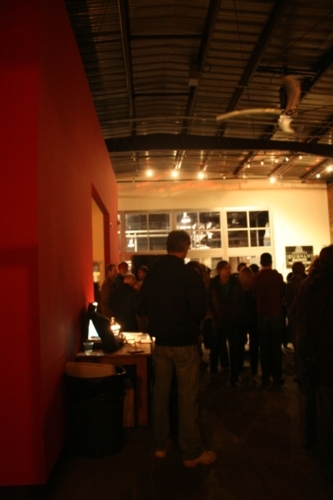 It’s a very welcoming space, and even not being a beer drinker, I enjoy hanging out there. 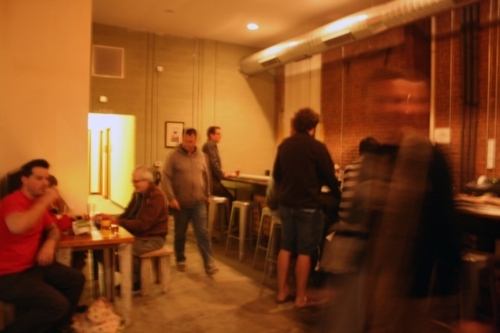 They also offer a rotating selection of beers from other local breweries priced at just a dollar more than their own. So far, I’ve liked their Pastinaak Parsnip Ale best, but it hasn’t been seen since the early summer. Such is the lot of a brewery focused on agriculture. I can’t offer an opinion on how good their beer is compared to other local offerings, however, but I can tell you that I’ve successfully made my way through four different pints and that rarely happens. My husband, who’s a bit of a beer connoisseur, finds Fullsteam’s offerings to be pretty good, liking the basil most out of the four or so he’s tried, but he hasn’t found a favorite as yet. I know they have an awful lot of fans out there, though, as I’m always hearing about rushes to fill those growlers. 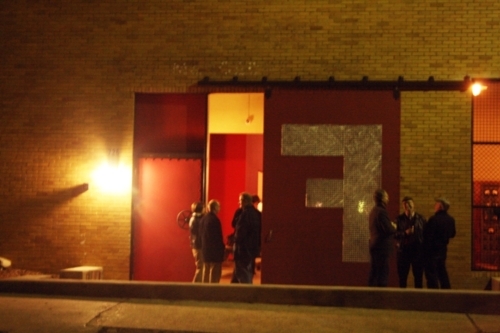 What’s your opinion of Fullsteam’s wares and space? Love the shot of the beer glasses :). I love the space too, so hip and fresh.